BoSS Clima is a premium aluminium modular access tower system featuring easy climb 0.25m rung spacing. 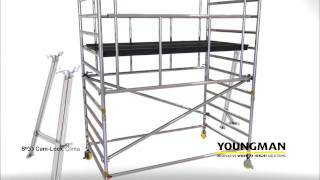 The 61302200 BoSS Clima AGR tower system has double 1.45m frame width that is 2.5m in platform length and 2.2m platform height. BoSS Clima is the ultimate versatile tower system, designed for the professional user. Uses an alternative BoSS Camlock AGR build method for quicker, safer and simpler assembly.